Non-governmental organizations (NGOs) play an important role in democracy. While corporations have interests, activists are loyal to a cause regardless of whom it benefits. Even if I disagree with an NGO's positions and objectives (for example, because it demands too much of a good thing), I can still respect or even admire the idealism with which activists pursue a given cause, if they are indeed loyal to it. But I have no respect for those who under the guise of grassroots activism advance, instead of a noble cause, corporate interests, regardless of whether they do so for financial gain or due to ideological bias (or both). When this happens, they become dishonest and use double standards. And when I say "they", this rarely includes well-meaning members and external supporters but is usually limited to the leadership of such organizations. There's a certain, transparent pattern. The Electronic Frontier Foundation (EFF) intermittently criticizes Google in contexts in which it's only about "end users v. Google" (1, 2), but never takes action against Google when it's about "Google v. other corporations", with other companies than Google promoting the interests of end users. Google knows that the EFF will give inconsequential lip service to its defense of digital liberties in fields in which Google doesn't face more resistence than a few screaming activists who can't force it to change any of its practices, but wherever Google has conflicts with its peers and could actually be forced by regulators or courts to do the right things, it knows that it can count on the EFF's support or, at a minimum, its deafening silence. Always. I attribute this pattern of non-principled behavior to the combination of two factors. On the one hand, both organizations are anti-IP. On the other hand, Google has generously rewarded the EFF for its loyalty on the important issues. "Q48. Does Android support existing Java apps? Q49. 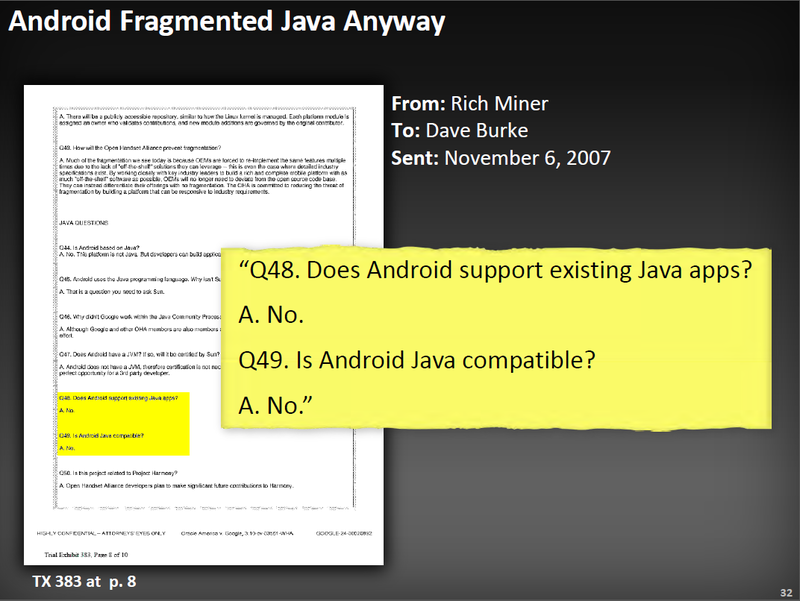 Is Android Java compatible? Second, antitrust regulators and courts have had (and still have) to intervene against Google's (Motorola's) assault on interoperability by reneging on FRAND licensing (and even on reciprocal-licensing) commitments relating to patents declared essential to telecommunications and video standard, attempting to hold end users hostage by threatening to disconnect many millions of users from cellular networks and to prevent them from watching video material they or their friends had purchased or recorded. In the U.S., the FTC found Google's (Motorola's) conduct anticompetitive and stressed that this hurts consumers, and the European Commission recently issued a Statement of Objections (SO), a preliminary antitrust ruling, for the same reasons. Policy makers (Senators, Congressmen) and industry associations including an organization of retailers (who sell everybody's products) expressed profound concern over this outrageous conduct on multiple occasions -- but the EFF did not submit a single amicus curiae brief or position paper to contribute to the pressure others put on Google. Just like Google has reneged on FRAND licensing and grant-back commitments, the EFF has reneged in this highly important context on its mission of "defending your rights in the digital world". I regret that I have to say so, but someone has to call them out for it. But where is the EFF now that the FRAND part of Judge Posner's ruling is being appealed by Google? The Posner appeal has prompted a similar number of amicus curiae briefs as Oracle v. Google. The EFF is silent. It will speak out against Google where it doesn't matter, but where Google has a dispute with Apple and a similar one with Microsoft, the EFF doesn't care about "your rights in the digital world". If you look for true defenders and promoters of interoperability, you can't count on the EFF. You have to look elsewhere. Your rights in the digital world are actually being defended vigorously by Oracle's lead counsel in the Google copyright appeal, Orrick's Joshua Rosenkranz, who is also fighting -- against Google -- for affirmance of Judge Posner's FRAND ruling. Oracle, as a member of BSA | The Software Alliance, also supports this noble cause. Microsoft's landmark FRAND case against Google's Motorola in the Western District of Washington has helped shape the law in consumer-friendly ways. But the EFF won't support any other company against Google, no matter how noble and important the cause is. That's where it draws the line -- and that is not a principled stance on interoperability. The EFF has orchestrated at least two of the four amicus curiae briefs that were submitted on Thursday in support of Google against Oracle's copyright appeal. These are also the only two pro-Google amicus briefs to have been published so far, and I will discuss their content (and the substance in them that I was hard-pressed to find) in a subsequent post. Before doing so, I wanted to draw more attention to Google and the EFF's insurmountable credibility problem in connection with interoperability. If Java apps don't run on Android, they have the chutzpah to call this state of affairs "interoperability". But if Google seeks sales and import bans over H.264, the format in which most of the world's digital video material is stored, or cellular standards like GPRS and 3G (UMTS), or WiFi (WLAN), everything's fine. I mean: fine with them. Not with me.